What comes to mind when thinking of the Hamptons? 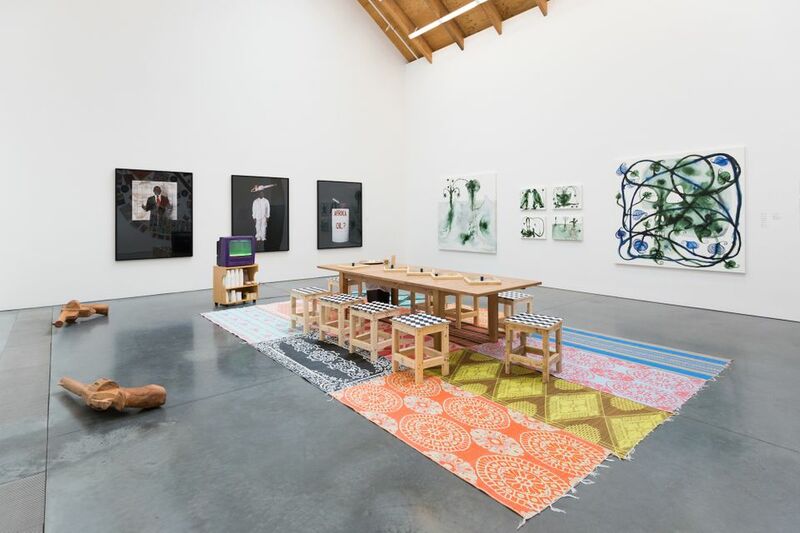 An African street café maybe doesn’t make the list, but New Yorkers catching the last of the summer rays on Long Island can experience just that with the participatory work Mobile Cafeteria by the Cameroonian-born Barthélémy Toguo, part of his current show at the Parrish Art Museum. The work—complete with various Ludo board games, colourful throw rugs and table settings to serve coffee—recreates the feel of gathering spaces in the Bandjoun Station, a non-profit school and creative cooperative that Toguo founded in Cameroon in 2008 to “set up vibrant and innovative structures [and] stimulate creativity and the desire for culture in Africa”, he writes in a statement. At its core, the piece addresses the concerns that gave rise to the conception of the Bandjouan Station, such as cultural and economic disparity in Africa furthered by the violent crisis between southwest and northwest Cameroon. Toguo, who spent the summer in residency at the nearby Watermill Centre, an idyllic arts lab launched by the avant-garde artist and theatre director Robert Wilson, has also created a series of new paintings, installations, sculptures and other works for the exhibition, which runs through 14 October.